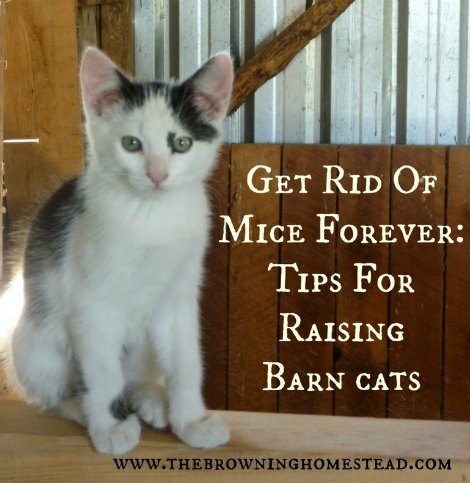 One of the biggest problems for people who have a homestead with various outbuildings is mice. Mice are seen as a nuisance that will eat food meant for cows, chickens, and goats. They can also get into machinery and damage wiring. Their dropping will typically be found everywhere. You can try one of these 11 natural ways to get of mice or simple add a few barn cats to your property. Most cats that are kept outside eventually will find mice to eat. However, kittens need to be taught that mice are a source of food. This is important as many cats simply might think a mouse is a plaything or toy and not eat it. Ideally, select kittens that come from a good mouser. Kittens from barn cat mommas likely will know already how to catch mice for food from observing their mother. When you bring a new kitten home, you will need to ensure the that it learns where its new home is located. This means you should not put the cat outside at first as it may wander off and not come back. You also will need to provide all your cats some quality food during winter when mice are less likely to be found.